Minnesota History Center, St. Paul, experienced water leaks during a recent heavy rainstorm. The heavy rains that drenched the Twin Cities on Monday May 19, 2014, resulted in minor flooding in certain parts of the Minnesota History Center. Above, rainwater pools in the egress stairwell next to the Historic Preservation Department, which responds to disasters statewide. This is a good reminder for museum buildings, as those built into the ground invite water to seek the lowest level. 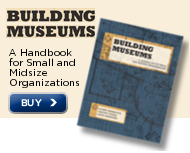 May is the time to do at least one thing to improve your museum's disaster preparedness. Minnesota Historical Society, Society of American Archivists, and Heritage Preservation's Heritage Emergency National Task Force. MHCHG offers a "Develop a Disaster Plan" structured grant option to encourage small organizations to prepare disaster plans. Don't delay; apply today. The next Minnesota Historical & Cultural Heritage Grants deadline for small grants ($10,000 and less) is Friday June 13, 2014. Contact the Grants Office with questions. Applicants to the Minnesota Historical & Cultural Heritage Grants mid/large program will receive email feedback on their pre-applications by early June. Final applications will be due via the grants portal before midnight on June 27, 2014. Contact the Grants Office with questions. A comprehensive historical evaluation of the car culture of University Avenue from its emergence in the early twentieth century through its heyday in the mid-late 1950s and the Porky's drive-in restaurant was completed. A narrative was written and completed, following published, archival, and first-person oral history research on the subject. The narrative and accompanying images will be used in a planned photographic mural, which will be installed on the railing of the new Episcopal Homes building now under construction on the former Porky's site. National Council on Public History will host a poster session at the AASLH meeting in St. Paul. History organizations in Minnesota are invited to submit proposals. New bird ID app is available--might be something of interest for the birders at your open-air sites or on your walking tours. Learn more about the direction the Cultural Data Project is taking. National September 11 Memorial Museum at ground zero opens to the public. The museum: temple or forum? State of Michigan (State Historic Preservation Office), Lansing MI, seeks Departmental Analyst--Grants Manager. Deadline: May 27, 2014, 5 p.m.
Illinois Labor History Society, Chicago IL, seeks Executive Director. Deadline: June 7, 2014. Freeport Historical Society, Freeport ME, seeks Executive Director. Deadline: June 30, 2014. Blue Earth County Historical Society, Mankato MN, hosts Grace and Richard Keir, who will present "Evolution of the Bicycle and Bicycle Clothing," Thursday May 22, 2014, 6 p.m. Call Heather, 507-345-5566, for more information. Mower County Historical Society, Austin MN, hosts Mike Eckers, who will speak on the "Mighty Eighth Air Force" of World War II, Thursday May 22, 2014, noon. Call 507-437-6082 for more information. Carlton County Historical Society, Cloquet MN, invites the public to celebrate Memorial Day, Monday May 26, 2014, 9 a.m. to 4 p.m. at the historical society. Allen R. Anway will present an encore presentation of "The Greatest Scientific Prize Ever Awarded in History," 2 p.m. Call 218-879-1938 for more information. St. Louis County Historical Society, Duluth MN, announces the next event of the Veterans' Memorial Hall program, a "History in a Pint" presentation by Dr. Tom Buck, "More than War Souvenirs: Reflections on Minnesota's WWII Veterans and their Japanese Swords," May 29, 2014, 6 p.m., Carmody Irish Pub. Call 218-733-7500 for more information. Northfield Historical Society, Northfield MN, announces the beginning of Northfield History Month, May 30, 2014. Festivities begin with a screening of two documentaries at St. Olaf College and end July 4 with fireworks. Check out the events list online. The historic museums of Red Wing MN will host the first ever Museum Crawl, May 31, 9 a.m. to 5 p.m.; and June 1, 11 a.m. to 5 p.m. Participating museums include: Aliveo Military Museum, American Ski Jumping Museum & Hall of Fame, Goodhue County Historical Society, Red Wing Marine Museum, Red Wing Pottery Museum, and Red Wing Shoe Company Museum. Free admission. Call 651-388-6024 for more information. Harkin Store, New Ulm MN, announces Dairy Day, Sunday June 1, 2014, 1-4 p.m., featuring homemade ice cream from Sylvia Reinhardt. Call 507-354-8666 or Nicollet County Historical Society, 507-934-2160, for more information. Brown County Historical Society, New Ulm MN, invites the public to join their newly formed book group. Meetings will be the first Wednesday of the month, 7 p.m., beginning June 4, 2014. The group will discuss "All God's Dangers: The Life of Nate Shaw." Call 507-233-2616 for more information. Washington County Historical Society, Stillwater MN, announces a presentation and book signing with Bruce Kohn, author of "Dakota Child, Governor's Daughter," Sunday June 8, 2014, 2 p.m., Warden's House Museum. Free. Call 651-439-5956 for more information. Ramsey County Library-Roseville hosts popular historian J.B. Andersen for a discussion of "The Year 1900: Good Times and Bad," Thursday June 12, 2014, 7 p.m. Call 651-724-6022 for more information. Rice County Historical Society, Faribault MN, hosts "An Evening of Irish Charm" event, Friday June 13, 2014, Faribault American Legion, 5 p.m. Music by Forty Shades of Green. Tickets: $25/person. Call 507-332-2121 for more information or to purchase tickets. Save the date for Scott County Historical Society's Ice Cream Social in the Stans Garden, Saturday June 14, 2014, 1:30-3 p.m. Free. Call 952-445-0378 for more information. Join Winona County Historical Society, Winona MN, for "Chocolate, Shakespeare and Champagne," Saturday June 14, 2014, 7-9 p.m. Tickets: $25/person; $20/WCHS members. Call 507-454-2723 x3 for more information. Ramsey County Library-New Brighton hosts New Brighton Area Historical Society, who will discuss the pioneers of New Brighton and the town they built, Tuesday June 17, 2014, 2 p.m. Call 651-724-6022 for more information. White Bear Lake Area Historical Society, White Bear Lake MN, will present a program on the recreational history of White Bear Lake, Wednesday June 18, 2014, 2 p.m., White Bear Council Chambers. Call 651-724-6022 for more information. Ramsey County Library-White Bear Lake hosts Sara Markoe Hanson, Executive Director of the White Bear Area Historical Society, who will speak on modes of transportation in White Bear, Monday June 23, 2014, 6 p.m., White Bear Council Chambers. Call 651-724-6022 for more information. Upper Midwest Digital Collections Conference, August 18-19, 2014, University of St. Thomas, Minneapolis Campus, Minneapolis MN, seeks program proposals. Deadline: May 24, 2014. National Council on Public History issues a Call for Proposals for their 2015 Annual Meeting, April 15-18, 2015, Nashville TN. Deadline for Topic Proposals: June 1, 2014. Deadline for Session and Workshop Proposals: July 15, 2014. Cultural Data Project announces Data Social: a Taste of the New CDP, Saturday June 14, 2014, 6:30-10 p.m., Omni Hotel, Nashville TN. This event is being held in conjunction with Americans for the Arts Annual Convention, June 13-15, 2014. Minnesota Alliance of Local History Museums announces that registration is now open for their Annual Meeting, June 19-20, 2014, Blue Earth County Historical Society, Mankato MN. View Session Descriptions. Several Minnesota museums are participating in the Blue Star Museums program, which offers free admission to all active duty military personnel and their families from Memorial Day to Labor Day. See the full list of participating museums online. St. Louis County Historical Society, Duluth MN, announces the appointment of Air Force veteran Harry Cottrell, the new Veterans' Memorial Hall Program Manager. Cottrell began his employment with the Society Friday May 2, 2014. Artspace and the Hastings Prescott Area Arts Council will launch an online survey of artists, arts organizations, and creative businesses in the Hastings River Valley to determine the need for a mixed use arts project. The eight-week survey will be lauched with a free public event, "Artists Under the Bridge," June 5, 2014, 5-7 p.m. The Nomenclature Task Force of AASLH is preparing to undertake a project to release Nomenclature 4.0 and seek your input and help. Submit recommendations for new terms, alternative categories for objects, and new definitions of objects. By now you’ve heard about Cornerstone Academy, the new preservation education program from the Preservation Alliance of Minnesota. Since the best learning experiences are student-focused, we are turning to YOU for input that will help us craft excellent, in-demand classes and workshops in the coming months and years. It takes 5-10 minutes to complete this survey. Share your thoughts and don’t be shy--your input has impact! Plus, don’t you need a little break in your day? Come on, take a few minutes and share what you really want to know. A picture of success! Minnesota's historical organizations frequently meet to discuss common issues, solutions, and successes. Nobles County Historical Society, Worthington MN, hosted the Spring Southwest Museum and Tourism Meeting, Wednesday May 14, 2014. The meeting included representatives from numerous history organizations in southwestern Minnesota, and a great opportunity to see the NCHS Pioneer Village following the meeting. Prairie, Lake, Forest: Minnesota's State Parks; photographs by Doug Ohman, text by Chris Niskanen.